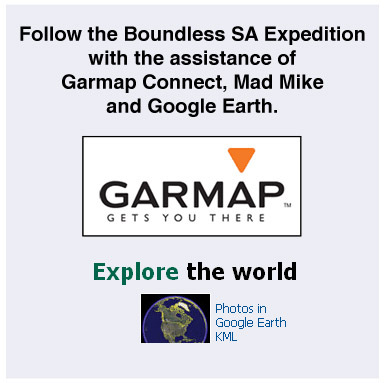 The Boundless Southern Africa Expedition is being Geo tagged by Mike and the route can now be followed. Please find instructions below on how to find it on Google Earth. Please follow these instructions carefully, even if you are a Google Earth expert. Sometimes the steps may have to be carried out in a slightly different sequence. Please use commonsense to get round these minor issues. We have tested them on various browsers and various operating systems and we are confident that they will work if your computer is set up correctly and you follow the instructions correctly. Unfortunately we cannot respond to emails which ask us to help - there are simply too many factors for us to try to do this. Your PC support people should be able to resolve any problems. 4. Click here to download the most recent KMZ Zip File of the BSA Expedition. You will be asked whether to open or save the file. Click on 'Save' and save the file to your desktop. Below, please find a list of tracklogs (KML files) from the BSA Expedition starting from day one. 7. There will be an updated Boundless SA entry in the 'Places' pane on the left. The entry will either be in Places or in Temporary Places. Click on the + to expand the 'Boundless SA' entry. Then expand the 'Boundless SA' entry, then the Data for Boundless SA entry. The latest location will be shown as 'Boundless SA. Check the box and double click the 'BSA Expedition'. Google Earth will take you to the last location for the Expedition. You may have to click on + or - to zoom in or out for best resolution. 9. To see the route and previous locations, first check the box next to History, then click on the + next to History to expand, then check the box next to Path. This will create a line between the hourly tracking points. Please note that the line connects all the points except the latest - we hope to have that changed shortly. Also note that you have to do this each time - we are also trying to solve this. 10. You can zoom in and out and follow the tracking line to see the whole route of the BSA Expedition. Be sure to check out the updated Photolog galleries by clicking here. Click the button below for more virtual images from the Expedition. To view more from BSA, please visit the YouTube BSA Home page by clicking here.